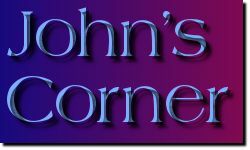 The year before on 14th to 18th January we were at Ballina – attending the Close Encounters Conference where Archangel Mikael had asked at our regular monthly meetings with Cosmic Sai Baba if He could speak at the Conference in January 2017. Archangel Mikael had made his entrance so loudly it almost knocked everyone out of their seat. He announced that the United Planetary Nations wished to present themselves en-masse at Uluru – and possibly at other Power Points around our Planet. The 12th of January 2018 was mentioned. 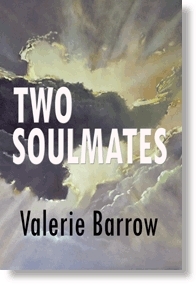 At the Inaugural Cosmic Consciousness Conference, Valerie Barrow will conduct a workshop, “Star People Revisited”. 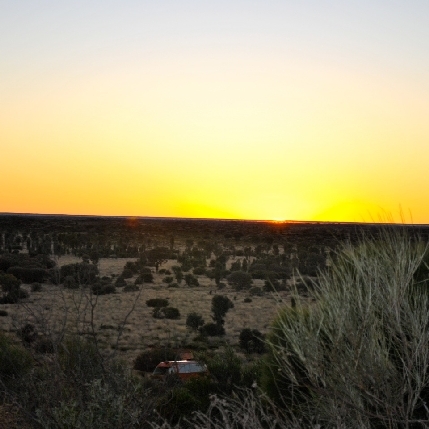 Valerie will be facilitating this workshop and the Outback Cosmic Skywatch. In addition, she will be channelling on Friday morning at the Conference. 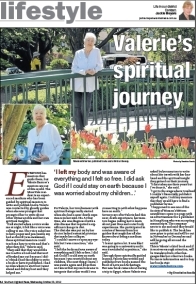 Valerie to give Workshop at Cosmic Consciousness Conference. 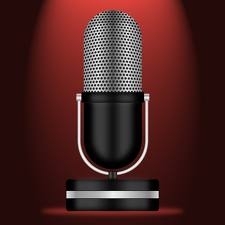 Valerie Barrow is a Medium and direct voice channel for ‘Alcheringa’ who is well known to the Australian Aborigines as a ‘Creator Spirit Ancestor’. 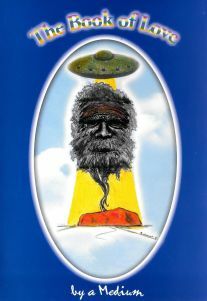 Also known as ‘The Golden One’, he resides at Uluru and will invite questions at Valerie’s Cosmic Consciousness meditation workshop entitled ‘Star People Revisited‘. Valerie is a spritely 85 years old with a lifetime of experience and more energy than most of us! 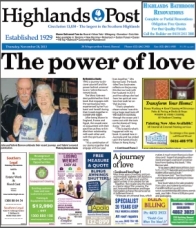 She has had several near Death Experiences that lead to doors opening into new understanding. 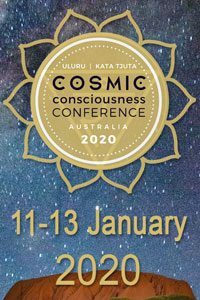 You can read more about the Cosmic Consciousness Conference at Uluru, on this website. I mentioned to my webmaster, the day before our usual meeting to receive our monthly transmission from Cosmic Sai Baba, that there seemed to be more about ET’s than ever on the Social media, news, and discussions, and that it could be leading finally to DISCLOSURE. That was on the 2nd January, 2017. 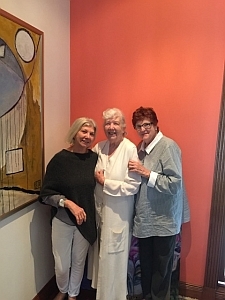 Then on the same day, my friendly webmaster wrote back and agreed especially when I had been reminded by ‘upstairs’ about the time in 1994 when a group of psychics visited Uluru. There had been a message received from Alcheringa saying The Star People were going to appear en-masse while we there, and it would receive world coverage. It didn’t happen – although we did feel we had been in contact with them in a hidden way. (This has all happened before we received the message from Archangel Mikael when he spoke at the Close Encounters Conference on 16th January and announced that the Star Planetary Nations wanted to show themselves at Uluru in January 2018 and they hoped they would be welcomed. So please spread the news… … they also said they wouldn’t be coming if they were going to be shot at.) Here is what my webmaster wrote, John and I had already been prompted to see the movie Arrival so don’t miss his review and understanding about it. Readers of the Cosmic Sai Baba transmissions will know that Archangel Mikael made his presence on the 3rd January 2017 – the day we normally receive a Transmission from Cosmic Sai Baba. Cosmic Sai Baba advised telepathically that he did not have a message that day but there was another who wished to speak. 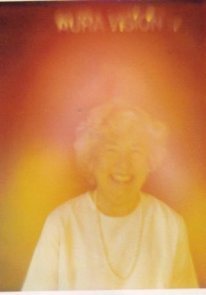 It was Archangel Mikael saying he would like to speak at the Conference Valerie Barrow (the medium) was going to address at Byron Bay, NSW on 16th January, 2017. A transcript of the Annunciation of Archangel Mikael is now given. 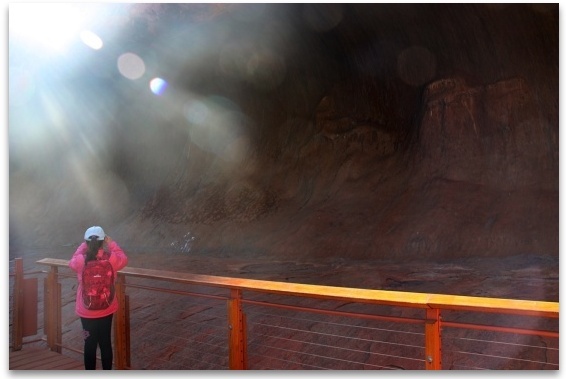 Belinda Pate writes: This was brought through when I travelled to Uluru (Ayers Rock) in the Northern Territory, Australia, in June last year, with my family. 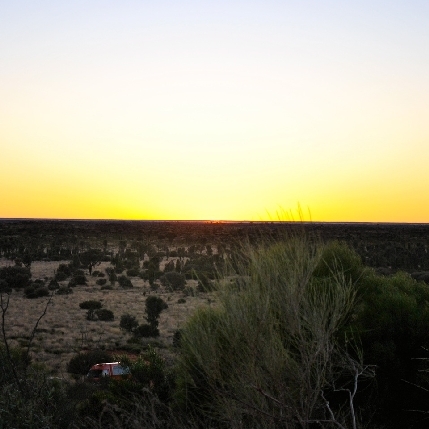 We spent the day absorbing various sites at Uluru and then at night I was guided to write. These messages are expansions of the holographic immersions I received during the day. Here is the first immersion. 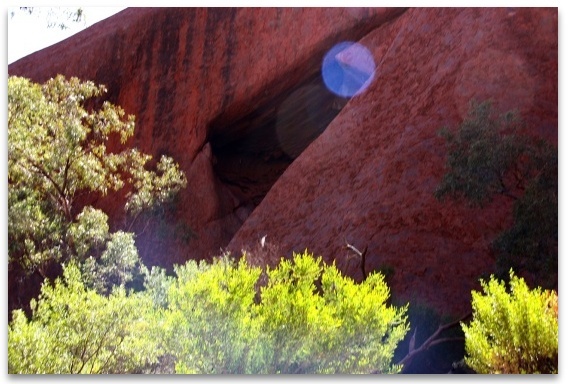 I connected tothe gatekeepers of Uluru (in my inner vision) and as I saw them, I realised there was another depth. I askedto go beyond the gatekeepers. A radiant burst of sunlight came through and I was attuned to the Cosmic Guardians. They are of the Great Central Sun and their primary purpose is unity. They shared that Sacred Sites hold Scriptures of Truth as they have been written in the Akasha for all who inhabit the Earth. These truths need to be recovered by each individual and integrated into their cells so that they form a new resonance. The power of these individual truths will “de-throne” all falsehoods and learned or inherited misperceptions of our lives and selves. These misperceptions must be transformed through our own hearts with pure Love so they can be released as liberated, transformed, alchemical vibrations of completion and return to the Universe as Success! They are successful because they have completed their cycle. They now add Light and Radiance back to the World. 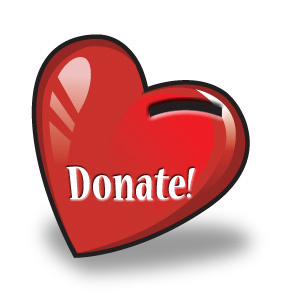 Their energy becomes an available possibility for transformation for others. As the falsehoods evolve and are replaced by Sacred Knowledge and timely Divine Truths, they then add a frequency of Unity. These Truths are frequencies — energetic vibrations. They are not actual books, records, scrolls or any physical written form. 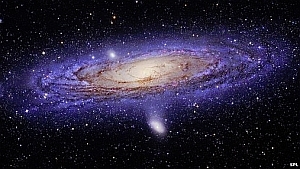 They are Cosmic, multi-dimensional realities that have been hidden from humankind by darkness. Because the Shift of Ages is at hand, it is essential that all beings on this planet who wish to evolve, claim the right to their unique vibrations of truth from the Scriptures of Truth. They must then embody them, recycle old fear energy into Love and Success and place that as an option into the mass consciousness. It was also shown to me that the Sacred Sites are markers for where the Scriptures of Truth are stored, across the planet. They embody all Truth. That is why anything which is false will be shaken out of people as they enter these sites. They also act as an attraction to people so they will visit these places regardless of whether they are “awake” or not. They will still absorb these truths. The vibrations contained in the physical manifestation of each set of truth essences, will attract those that need to access what is deeper in the Inner Earth. This has been held until such time as the consciousness here is ready to receive it. 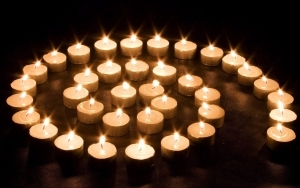 Others who are Lightworkers will come as Code Activators. 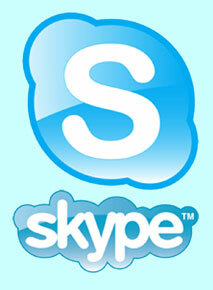 They will act as translators and disseminators for those who can’t physically access these sites. Their physical attendance of these sites will trigger a coded pattern that unlocks certain truths when the global timing is right. The new patterning will be more easily available for others once it has been activated and de-coded, then brought into the open atmosphere. I was also shown that it is important to pay respect to the Elders of the cultures where these Sacred Sites exist. The Ancestors are the gatekeepers of the Cosmic Scriptures in the 3rd and 4th dimensions. Because we are in 3D transiting 4D bodies now, we need to honour them and ask permission to enter from a 3D perspective. Then we can go deeper and access the multi-dimensional truths that are ours. EVERYONE must access these truths for the shift to take place. Those who cannot come in person will be connected to a Code Activator who will mirror a completed code to them and set off an internal and multi-body vibration. This vibration will seek a balanced pattern, or harmony, that resonates with their part of the Scriptures of Truth, which needs to be recognised now. We must all recognise this Truth, and believe it, for the wave of Love and clarity to have effect around the globe. Stepping into beauty, love and success must be a new reality. We have reached the end of our limitations and now must go beyond them to access our limitlessness. The Scriptures of Truth are held by a cohesive, unified recognition of Truth in all humankind simultaneously. They will unfold and be a simultaneous awareness in all consciousness on this planet when they are felt and owned. It will be like all cogs clicking into place. Like a huge mandala or sacred geometry pattern coming into place, into completion. This is the Shift of the Ages. Stand up for Self Love. The harmonics this creates reach universally and galactically. And so the Galactic Hologram spins and changes and the Earth’s future shifts and reforms. There is a clarity in this shift that creates a Cosmic access point so that Higher Truth, as it is known in the Light cells of humans, may activate and open again. The Matrix is re-aligned and a flood of new energy is allowed through by our own permission to evolve as a race. We thus create our future in Oneness. It is Oneness that allows the future to take shape as it shifts the access points to a pattern which is recognised Cosmically. The Flow of Divine Order may nourish the Earth again. 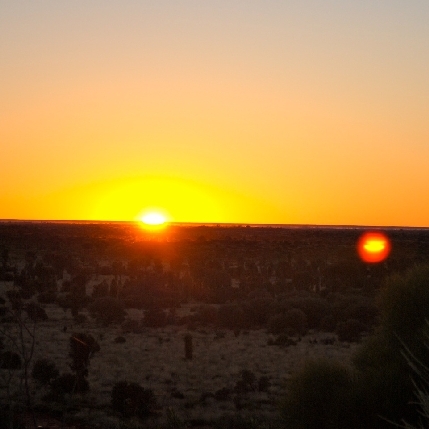 A recent visitor to Uluru went to Kata Tjuta and took photos of the rising sun one morning, recently. 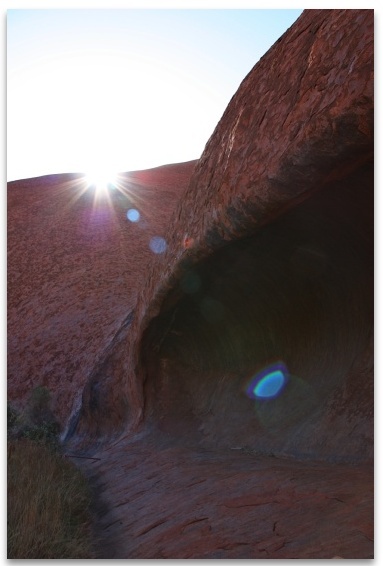 These images—taken at Uluru on the morning of 1 May 2012—have been sent to Valerie by a friend, who has agreed to allow publiction of these images on the condition of anonymity. The Images have been enhanced to show definition, as it was quite dark. 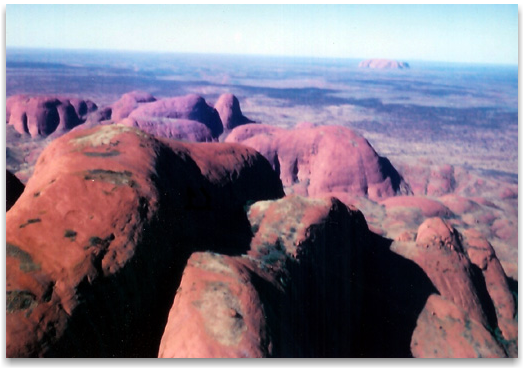 These images were taken looking from Kata Tjuta. 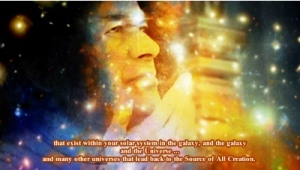 Cosmic Sai Baba has made it known to us that he was there and had shown himself to the people. Scientist have recently concluded that dinosaur gases may have warmed the Earth. Alcheringa confirms this and gives information about the comets that impacted the Earth 65 million years ago. Researchers have recently calculated and discerned that giant dinosaurs could have warmed the planet with their gases. Scientists have calculated the methane output of sauropods, including the species known as Brontosaurus. By scaling up the digestive wind of cows, they estimate that the total population of dinosaurs, produced 520 million tonnes of gas annually. This suggests the gas could have been a key factor in the warm climate 150 million years ago. You can read more here, and on BBC Nature. 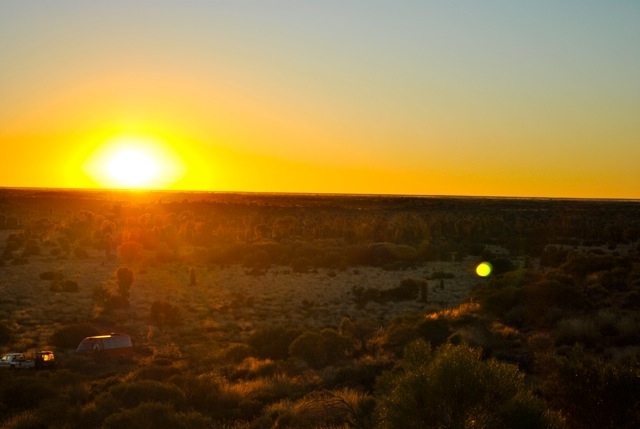 This is what Alcheringa had advised me while sitting with the Australian Indigenous Sacred Stone from the stars – known as an Alcheringa Stone. This was in 1994. This was the same time astronomers observed comet Schoemaker-Levy 9 break up into pieces and slam into Jupiter. 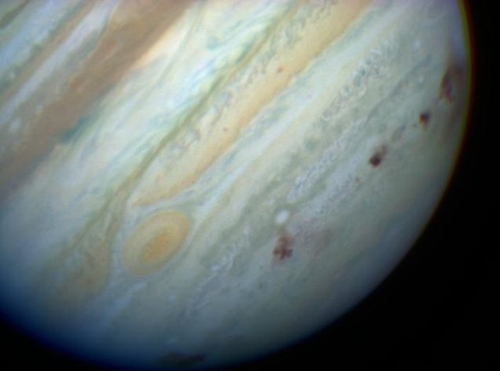 Brown spots mark the places where fragments of Comet Shoemaker-Levy 9 tore through Jupiter’s atmosphere in July 1994. It happened in 1994. This was the same year we were given the information about Uluru being an Comet. I felt it was a replay on Jupiter that had happened on Earth. They say there are cycles within cycles. 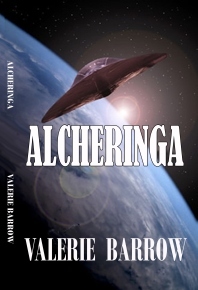 Alcheringa had advised that the Dinosaurs had become so large and so dangerous that a reluctant decision for their destruction was made by the Hierarchy of the Star Worlds. That the huge herbivores were eating all the grasses and leafy green leaves from the trees, therefore killing the trees and that it was destroying the earth’s atmosphere – for carbon dioxide could no longer be converted to oxygen. 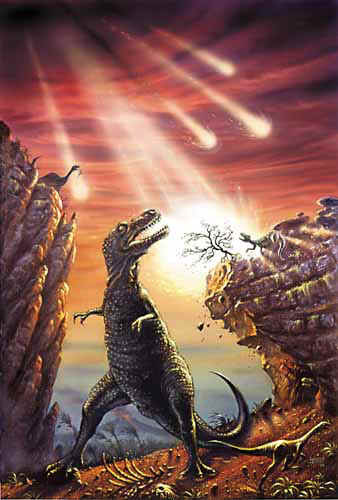 Coupled with that the huge dangerous killer Dinosaurs were fighting with each other and killing one another. The bodies were so large it took far too long for the bodies to disintegrate back into the Eearth. The odour of decaying and disintegrating herbivore bodies was horrific and the earth’s atmosphere was being deprived of life giving oxygen. With the decision that the Dinosaurs had to be destroyed a huge Asteroid was engineered and brought onto our earth by the starpeople. It broke into nine pieces but the main body of the Asteroid landed in the centre of the land now known as Australia. This rock (or inselberg) is known as Uluru. Three years ago,I was called upon by Alcheringa to sit at my computer and he would prompt me with questions to research on Google and write an article about finding the giant Impact Crater that was caused as the Asteroid came into and landed in the ancient Eromanga Sea that had existed in the centre of Australia. 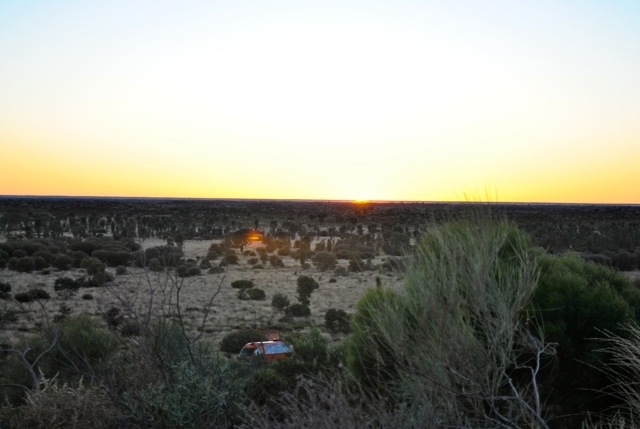 In the night, only a week ago, and just before I saw the headlines of the scientific study that Dinosaur Gas May have warmed the earth, I was prompted by Alcheringa to write a little more about the connection to Kata Tjuta and Uluru. Alcheringa has already advised us that the Asteroid plus nine parts of it had spread around the world and that the main part was Uluru (or Ayers Rock) in Australia. As it landed in the shallow Eromanga Sea it pushed the sea bed ahead that formed into very high mountainous mounds we now call Kata Tjuta (or The Olgas). of how the earth reacted when an asteroid hit the earth at a time between 10,000 to 14,000 years ago, you can easily understand how it must have been and even worse when the Dinosaurs were destroyed, 65 million years ago on Earth. Scientists do not agree that Uluru is an asteroid. (Its mass extends six kilometres beneath it.) 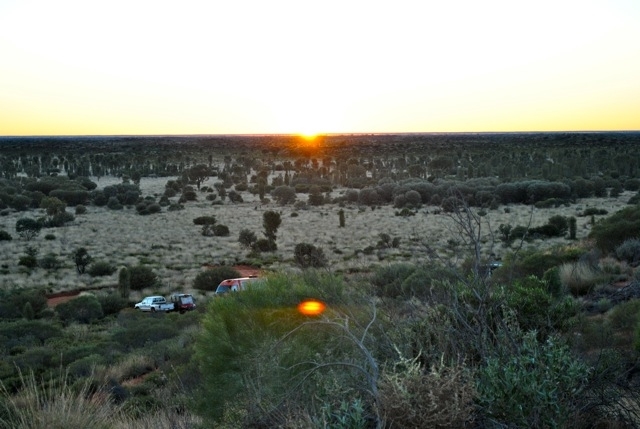 Uluru is described as Arkose rich in Feldspar. It has been shown that asteroids do have feldspar present. Kata Tjuta is conglomerate rock looking very much like an ancient sea bed. 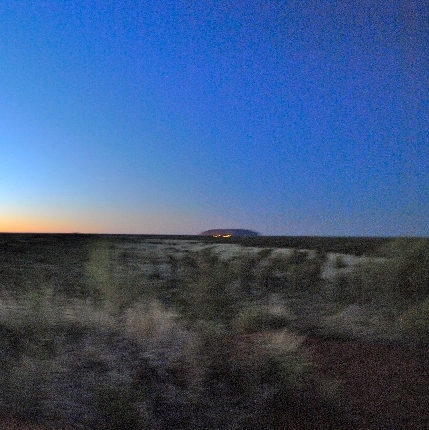 Scientists describe Uluru as tilted to 85 degree angle and Kata Tjuta has tilted some 20 degrees. Much of Uluru and Kata Tjuta is hidden by silt and sand and that they are really massive from what you can see above the ground. 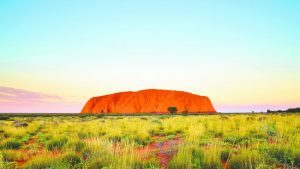 Scientists say that Uluru and Kata Tjuta are part of the same left overs of a huge sediment base that has formed hundreds of millions of years ago. And yet Kata Tjuta is conglomerate rock looking like an ancient sea bed and still breaks up. 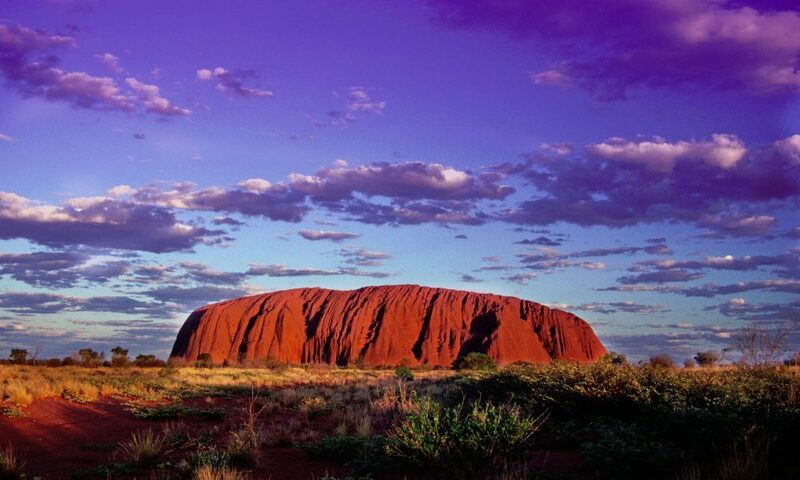 Uluru is arkose sandstone rich in feldspar and is naturally grey in colour. The whole of the centre of Australia, called the ‘Red Centre’ is covered in red iron oxide earth clay, which St. Germain mentions in his description of the Fall of Atlantis. 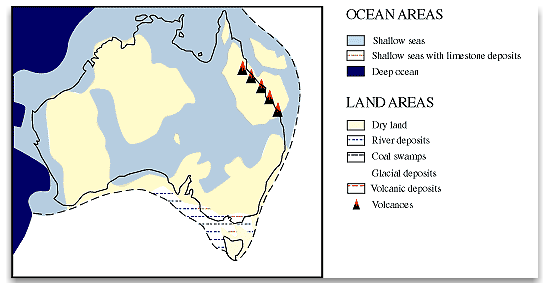 Coming back to being prompted by Alcheringa to write this article he has given me an image of how Uluru came in at an angle – hitting the seabed – pushing up the sea bed to form Kata Tjuta at a lesser angle and forming a GIANT impact crater which has since dried out and filled after ‘the Fall of Atlantis’ which affects happened all over the earth. Alcheringa reminded me of how scientists have discovered a paleovalley that exists between Uluru and Kata Tjuta beneath the red sand linking them on the ground. 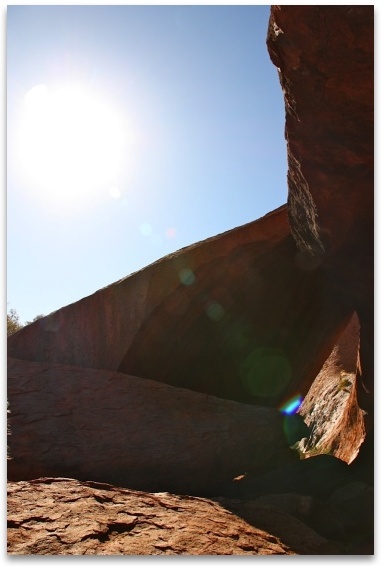 Underneath the ground where you cannot see – there are mounds they call amini-Kata Tjuta. That to me is showing a direct push ahead of the ancient sea bed by the incoming asteroid. 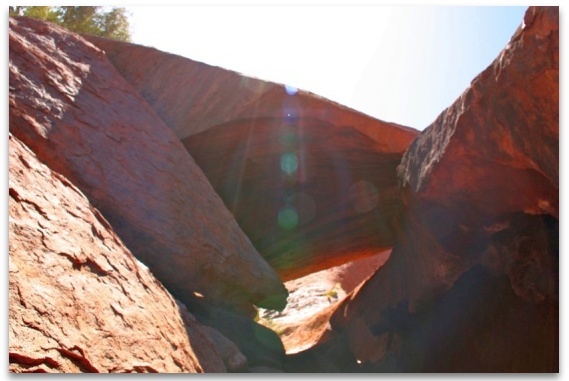 For scientific analysis and more information on the ancient sea beds and the paleovalley drainage at Kata Tjuta and Uluru, see the summary of the article on this matter at the CSIRO website for The Rangeland Journal. 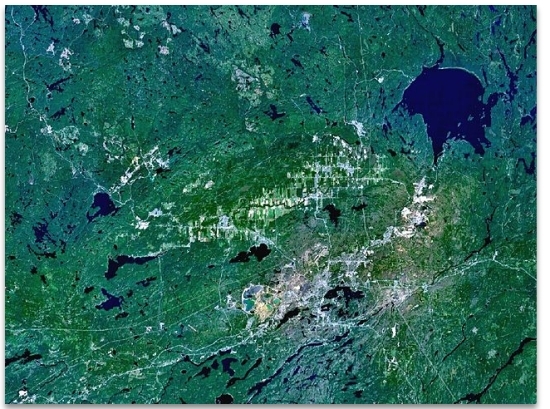 This Sudbury Crater in Ontario Canada was pointed out to me by a scientist back in 1995. It looks like an impact crater that has later been filled in. 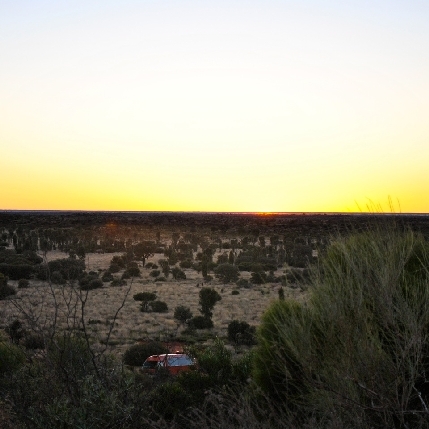 The scientist told me he understood what the message from upstairs was about regarding Uluru. It all sits in the middle of the hypothetical Centralian Basin, which contains the Armadeus Basin, which I wrote about here.